Pizza is in the DNA of all Neapolitans so it is fitting Napoli born chef, Gianluca Donzelli is the head pizzaiolo at Pizzaperta. In the Pizzaperta kitchen, Gianluca shares his hometown traditions and expertise acquired from years of pizza making. Gianluca discovered his love of cooking as a child where he enjoyed being around the kitchen; the smell and the taste of the amazing Neapolitan food his mother and grandmother would create. After travelling to Australia and then returning back to Italy in 2008, it was at age 25 Gianluca made the decision to become a full time chef. Gianluca attended one of the best chef schools in Italy, “Scuola Professionale di cucina del Gambero Rosso” and studied with renowned chef, Enzo Coccia, before working as a baker at two-Michelin-star Restaurant Don Alfonso near Sorrento. Having a strong passion for surfing, it was Gianluca’s desire for water and the Australian surf that saw him return to Australia in 2010 where he worked at Sydney’s Beresford Hotel. It was here Gianluca met his good friend and mentor, Gabriele Taddeucci, head chef of Osteria Balla. In September 2013, Gianluca continued his pursuit for pizza making and placed 4th at the International Pizza Competition in Naples where he was named an Ambassador of Neapolitan Pizza and Culture in Australia. Among his other achievements, Gianluca is also an International pizza Master Instructor, certified by the Accademia Pizzaioli Italiani. In mid-2014 , Gabriele Taddeucci introduced Gianluca to Stefano Manfredi , who subsequently invited him to join his family of Manfredi head chefs and to take the helm in the PIzzaperta Kitchen . 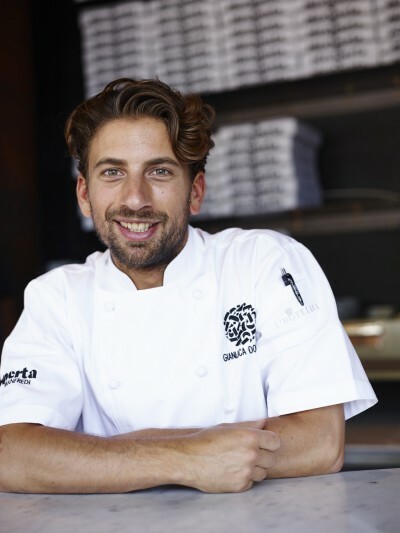 Today, you will find Gianluca working hard in the Pizzaperta kitchen, or surfing the waves in Bondi. We are very happy to have Chef Donzelli as our chef and pizzaiolo at Pizzaperta and we look forward to many years together.